KALAMAZOO, MI. The Force (4-0) went on the road again to face the West Michigan Mayhem (3-2) and dominated in a comfortable win featuring 7 touchdown passes. It was the first time this season that the Force did not have to contend with cold and rainy conditions. On their initial possession Chicago quarterback Sami Grisafe scored on a 3 yard QB sneak. Chicago led 6-0 after a bad snap foiled the point after attempt. The Mayhem found the going pretty easy on their first drive as well, pushing the Force defense back and getting running room on the edge. The Mayhem punched it in and added the extra point to lead 7-6 with 3:41 left in 1st quarter. They didn't get to enjoy it for long. Starting from their own 25, Grisafe completed an 11 yard pass to wide receiver Jeanette Gray for a first down. On the next play Grisafe found running back Brandy Hatcher over the middle and she took it the distance for a 64 TD reception. Again the snap was bad, leaving the Chicago lead at 12-7 with 2:10 left in first quarter. Midway through the 2nd quarter Force linebacker Darcy Leslie stuffed the Mayhem running back at the line of scrimmage and ripped the ball from her hands to force and recover a fumble. The Chicago offense started from their 41 yard line and on the 5th play of the drive Grisafe connected with Gray for a 33 yard touchdown pass. This time Ashley Berggren took the snap and passed to Hatcher who made an acrobatic catch for the 2 point conversion. Force went ahead 20-7 with 6:15 remaining in the half. 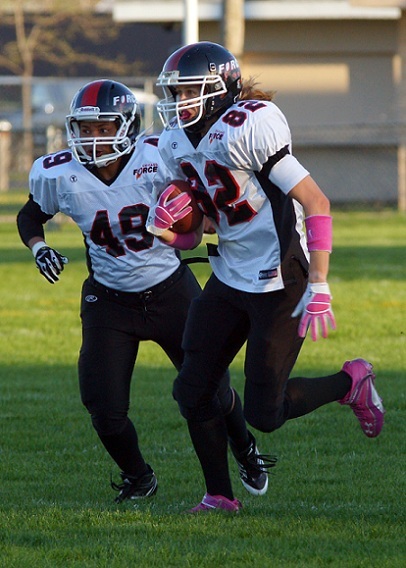 The Mayhem's first play was a long pass attempt that was picked off by defensive back Martha Dantuma, who returned it 15 yards to the Mayhem 40 yard line. Hatcher then tore off a 22 yard run for a first down. A pass to Gray at the 5 yard line bounced into the hands of the Mayhem defender for an interception that was returned to their 20 yard line. The Force defense then came alive with Kim Marks dropping the ball carrier in the backfield for a 3 yard loss. On third down Candace Griffin sacked the Mayhem quarterback for a six yard loss. After the downed punt, Chicago started in Mayhem territory. The first play was a pass to wide receiver Ashley Berggren over the middle, she dashed untouched into the end zone for a 42 yard score. Tricia Charbonneau's extra point kick missed, hitting the crossbar. The Force led 26-7 and it stayed that way until halftime. On their initial second half possession the Mayhem missed a long field goal attempt, and the Force offense took over with Grisafe throwing a perfect pass to Berggren. Berggie sprinted down the left sideline, stiff-arming a would-be tackler to the ground en route to a 74 yard touchdown. Grisafe then found Gray over the middle for a 2 point pass conversion and a 34-7 lead with 7:36 left in the third quarter. West Michigan's next possession went awry with an overthrown pass that Martha Dantuma intercepted (her second of the game) and returned for a 52 yard touchdown. The 2 point conversion failed, but the floodgates were officially open as Chicago extended their lead to 40-7 midway through the third quarter. West Michigan inexplicably failed to field Charbonneau's kickoff and Dana Vermilye recovered for the Force at the Mayhem 20 yard line. Grisafe soon scored on a 1 yard QB keeper, the 2 point conversion attempt was no good and Chicago leads 46-7. The Mayhem return team falters again, fumbling the ball back to Chicago at the 35 yard line. A 30 yard completion to Berggren is followed by a short pass to Gray behind the line of scrimmage. Gray tries to reach the corner of the end zone and gets there compliments of a nasty crack-back block by wide receiver Taylor Malloy. Then Grisafe pitched a shovel pass to Hatcher, who strolled in easily for the 2 point conversion. Force 54, Mayhem 7. On the ensuing possession Force linebacker Rebecca Thuestad blocked the Mayhem punt giving the Chicago offense great field position at the Mayhem 38 yard line. Running back Mary Choules burst through for a gain of 23 yards to the Mayhem 15. Grisafe then found Malloy in the corner of the end zone for another touchdown. The 2 point conversion fails and Chicago now leads 60-7. On West Michigan's final possession the officials played a huge role by calling 2 more phantom pass interference penalties. Eventually the Mayhem reached the end zone on a 5 yard touchdown play but fail on the 2 point conversion. Chicago 60, West Michigan 13. On the final possession with less than a minute to play, Grisafe completed 3 passes in a row to Hatcher (28 yards), Vermilye (17 yards) and Gray for a 12 yard touchdown. Charbonneau's kick was good for the final margin of 67-13. Grisafe had a huge day, completing 24 of 42 attempts for 380 yards, 7 touchdown passes and adding 2 rushing TDs. The defense was led by Darcy Leslie (9 tackles), Elisha Okrey (8 tackles), Candace Griffin (5 tackles and a sack), Dorian Bridges (4 tackles, 2 pass break ups) and Martha Dantuma with 2 interceptions. The Force return to the Mitten next week to face the Detroit Dark Angels in a divisional game. The next home game will be June first when they take on the rival Kansas City Tribe at 5pm at Evanston High School's Lazier Field.